Perhaps bored of living life as one of Africa's longest serving dictators, could Colonel Muammar al-Gaddafi be in search of a bigger political stage? He staunchly supports the African Union's agenda for a 'United States of Africa.' This concept may be somewhat attractive to some African leaders and citizens who believe that Africa needs to consolidate its human and natural resources. Some have argued that great economic deserts in Africa may disappear with a strong federation and robust economic activities in a United States of Africa. The greatest question is, are African leaders prepared to shake off believing that a united Africa is an impossibility? If that is the case, a realization amongst such leaders must have set in regarding Kwame Nkrumah's 1963 vision: "I have often been accused of pursuing a policy of the impossible. But I cannot believe in the impossibility of achieving African union � Africa must unite. We have before us not only an opportunity but an historic duty." Nkrumah's vision may have been delayed for over fifty years for many reasons not unconnected to African leaders' desire to stay in power forever. Is Africa, therefore, witnessing the making of an all-Africa dictator in the form of an internationally-known autocrat seeking a larger throne? Or is this an awakening of Gaddafi's failed attempt to acquire greater power in Africa through rebellious movements now cloaked in all-African diplomacy? The fact remains that Gadaffi supported Charles Taylor and Foday Sanchoh's rebel wars in Sierra Leone and Liberia that left over 500,000 dead and thousands more limbless in both countries. Taylor is now on trial in The Hague for alleged crimes against humanity in the civil wars and Foday Sankoh died in the custody of the Special Court of Sierra Leone while awaiting trial on the same charges. 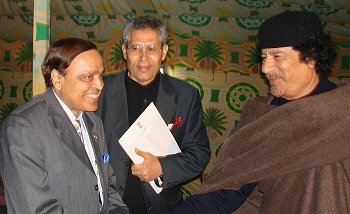 Intriguingly, Gaddafi is traveling with huge entourages complete with a heavy bodyguard presence across the wide African plains and Savannah grasslands, peddling his all-African Agenda. His sponsored rebellion in the region went through the very poorest nations along the west coast of Africa � Sierra Leone and Liberia. But he is now wooing their post-war leaders, who have managed to carry on in fledgling democracies, for support of his newfound diplomatic cause for a United States of Africa. Poor countries like Liberia and Sierra Leone have proven, over and over again, that they are readily prepared to succumb to the rules imposed by powerful and affluent nations rather than following their own principles or convictions. They also remain vulnerable to subversion by these powerful nations through leaders such as Taylor and Sankoh, who accept material and financial assistance to take power by force and carry out their masters' bidding. Gaddafi seems to be on both tracks in his quest for greater power. In an Oct. 2006 Worldpress.org article I stated: "The Castros and the Muammar al-Qaddafis own the national bank vaults and the people in their countries. Because our [Sierra Leone's] leaders are corrupt, they align themselves with these so-called benevolent dictators for the simple fact that they give aid that is intended to directly benefit the country, but without accountability. Only God that knows what happens after such goodwill." During his visit to Sierra Leone, addressing a hungry crowd that welcomed him, Gadaffi revealed that he made a donation of two shipments of rice and money to the tune of $2 million to the people of Sierra Leone. Of course, the rice and the money had disappeared like ships in the Bermuda Triangle. Too little too late, President Kabbah, frantically, tried with great effort to explain how his government had used the money that was never talked about. This has brought great shame upon the ruling party less than two months before the Aug. 11 general elections. The Colonel therefore has left a big problem in Sierra Leone for the ruling party. People are calling in to local radio stations to voice their dissatisfaction, especially over the missing rice shipments. Meanwhile, Libyans do not seem to be sold on the idea of a united Africa. If they were, the eruption of xenophobia in Libya in recent years could not have happened. The BBC's Talking Points on Tuesday, Oct. 10, 2000, stated in a program titled, "Gaddafi's Libya: African brother or simply racist? ": "During the past week, thousands of African immigrants living in Libya have been attacked by local residents. Some have had to take refuge in their respective embassies. Nigeria has already taken steps to repatriate all illegal Nigerian immigrants from Libya. This eruption of xenophobia comes in the face of Libyan leader Muammar Gaddafi's attempts to build an African Union." In Sierra Leone, Gaddafi stated how disturbing it was to see Africans dying to cross into Europe in boats and posited that the only place for Africans is Africa; Africans should not run away but to stay and tough it out in a united continent. The Special Court of Sierra Leone is a hybrid court set up by the government of Sierra Leone and the United Nations to bring to justice those who bore the greatest responsibility for crimes against humanity in Sierra Leone during its civil war. It seems Gaddafi is making an unintended mockery of the institution, according to the sentiments that are being expressed by some Sierra Leoneans both within the coutry and abroad. One social commentator, in a reply to a question from a concerned citizen who asked why people were coming out in throngs to welcome Gaddiffi, answered, "What do these people know about his connection to the civil war?" But for the center to hold for a true united Africa, it must come from leaders who have manifested strong willingness to support and govern their people by good democratic and human rights principles. Ghana, the birth place of Nkrumah's united Africa vision has been making great democratic strides since Jerry John Rawlings reversed what had seemed like a failed state before his two military coups and transfer of power to a civilian government through the voice of the citizens. With the knowledge of the atrocities committed by Charles Taylor and the late Foday Sanchoh's misguided rebels who were notorious for the hacking off of limbs of their victims akin to King Leopold's Congo Free State, a concerned citizen called Gadaffi's visit to that nation, "an affront to the people," comparing it to the erection of King Leopold's statue on horseback in the Congo. If Libya is dead serious about a democratically united Africa, it should be working behind the curtain with countries like South Africa, Botswana, and Ghana, and maybe Nigeria, that can boast of some progress with democratic governance, and stand behind them in public. This is because according to what many are saying, Africa may be in need of strong unity, but certainly not being led by a colonel with blood on his hands.